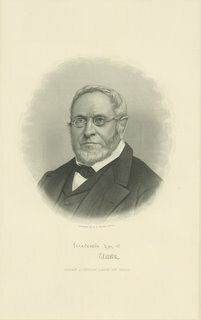 Early Ohio lawyer Ebenezer Lane was a Harvard University graduate who moved to Ohio in 1817. Born in Massachusetts in 1793, he received his degree from Harvard in 1811. After briefly practicing law in New England, he migrated westward and settled in Ohio, where he established his legal practice (around 1817). He was appointed Judge of Common Pleas of the Second Circuit in 1824, and became a Judge of the Supreme Court of Ohio in 1830. After he retired from the court, he had interests in the Junction Railroad, the Mad River and Lake Erie Railroad, and the Illinois Central Railroad. After Judge Lane’s death in 1866, his book collection was passed down to his son Dr. Ebenezer S. Lane, in Chicago. The Ebenezer Lane library was the only library collection within the city limits of Chicago to survive the Great Chicago Fire of 1871. In 1922 the Ebenezer Lane book collection was donated to the University of Chicago by his grandchildren, the third Ebenezer Lane and Fanny Griswold Lane. 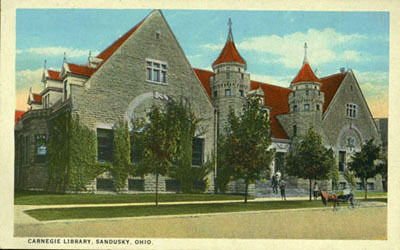 Judge Lane’s granddaughter, Mrs. Charles H. Moss, served on the first Board of Trustees of the “Library Association of Sandusky” which was incorporated in 1895. A sketch of the life of Judge Ebenezer Lane can be found in the June 1867 Firelands Pioneer. The Ohio Supreme Court's Cases of Judge Ebenezer Lane are available in the Archives Research Center in the Sandusky Library.